Last Saturday, I got a special treat: Steamed lobster dripping with melted butter, and a night off from cooking. That’s right– my man made me a fancy dinner just because my weekend was busy. 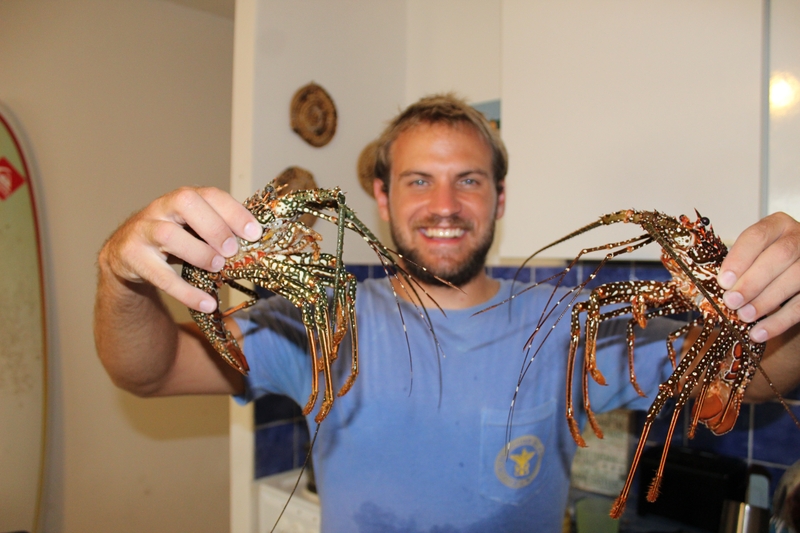 He and his friend Matt made an amazing seafood meal of baked fish and steamed lobster. You can make it, too! 3rd Culture Wife has moved to a new permanent home, www.3rdculturewife.com. To view this recipe, visit the new site. Please subscribe to the new website! Check out the new 3rd Culture Wife website! It is www.3rdCultureWife.com, and it includes all of what you love about this blog and more. After blogging here for a year, I literally outgrew the space allotted to me and had to move. I hope you’ll visit the new site, like and subscribe! There is so much to do in Saint Martin/Sint Maarten! Go beyond the beaches and explore some of SXM’s kid-friendly activities. Discover ruins, fly through a rain forest, or feel the whisper of a butterfly’s wings. Make your time on Saint Martin the best family vacation ever! The Zoo may not be as large or as varied as animal parks in big cities, but it is the perfect size to see with kids in an afternoon. Learn about endemic animals as well as exotic species. How to get there: Drive to Pond Road in Philipsburg and go north on the Saltpicker’s Roundabout. Turn left at the end of Pond Island and follow the signs. The Butterfly Farm is a magical place for kids. Walk through a butterfly enclosure and let the papillons softly land on you. Learn about different types of butterflies and moths. How to get there: Drive toward Galion Beach on the east side of the island. Take the turnoff to Galion Beach, and the farm is on your right. Loterie Farm has something for everyone. Located on the grounds of an old sugar plantation, this site is loaded with both history and modern outdoor entertainment. You can take the nature hike, relax by the state-of-the-art pool, or try one of the three zip lines: the kids’ Tarzan zip line, the ropes course zip line, or (for the very adventurous), the extreme course. Keep an eye out– you may see the resident vervet monkeys! The park is closed on Mondays. How to get there: Go north from Marigot and turn left at the “Pic Paradis” sign. The park is on your right. Cost: 5 Euros for the hike, 25 Euros for the kids’ zip line, 45 Euros and 65 Euros for the medium and extreme zip lines. Pool chair a towel is 25 Euros up, and is required for pool entrance. The park takes US dollars as well. Buffalo Wild Wings has a fun kids’ area at the Blue Mall in Cupecoy. I haven’t been there personally, but I hear that it’s a favorite with the expat kids. How to get there: Blue Mall is located west of Maho in near Cupecoy Beach. Seaside Nature Park is a little slice of farmland heaven. You can ride horses on the beach, play on the playground, or feed the animals at the petting zoo. The park also has a playground and a trampoline! How to get there: From Maho, go through Simpson Bay to Cole BayTurn right just before Daily Extra Supermarket, and take a left at the end of the road (From Philipsburg, turn left when you come down the hill to Cole Bay Go through the one-way street, turn left, and then go right before Daily Extra Supermarket). You have to drive through the GEBE power plant, which seems odd, but you are going the right way! Cost: $60 for a an hour trail ride on the horses. Petting zoo is $5 per adult and $3 per child. Bags of feed are $1 each. Feeding the Donkey and Horses in French Cul-de-Sac is a great free activity to do on your way to the beach or Pinel Island. How to get there: From Marigot, go north until you find the round-a-bout toward Pinel Island in French Cul-de-Sac. Turn left at the school and then follow the road past the school and up the hill to the donkeys and horses. Carousel is our favorite ice cream store. Not only does this place offer delicious ice cream and cotton candy, it also has a full-sized carousel in the back! Cost: $3+ for ice cream. Carousel ride is free with purchase on Wednesdays. Sonesta Kids Zone is a great place to drop off your kids while you relax at the pool. The awesome staff will take care of your kids with games, movies, and fun while you get a break. How to get there: In Maho. you can’t miss it. Cost: In order to visit the Kid’s Zone, you have to either stay at Sonesta or purchase an all-inclusive day pass, which is about $90/person for adults. The Movie Theater is perfect for those days when your beach plans got rained out. Tickets are actually cheaper than most U.S. theaters. Free Outdoor Movie on Mondays at Porto Cupecoy is a fun way to end the day. Just be sure to check the exact time, as they often change it, and ask ahead of time for the title and rating of the movie. Sometimes it’s a family movie, and other times it’s an adult movie. You can buy popcorn and ice cream at Rendezvous. How to get there: Drive west from Maho and Cupecoy or south from Marigot. Free Kids’ Movie Night at Kim Sha Beach is a good Friday night activity. Adults can also enjoy the food and drink selection at Buccaneer Beach Bar. How to get there: Coming from the airport, drive through Simpson Bay and turn right after Burger King. Park at Buccaneer Beach Bar. Layla’s Restaurant and Play Ground is one of the few jungle gyms on the island. Enjoy the French Caribbean and let your little monkeys play the day away. How to get there: Coming from Marigot, go southwest to the “handle” of the island. After Sandyground, you’ll see Layla’s on the right. Coconut Trees Go Karting is great for older kids and teens. Enjoy some healthy competition and adrenaline! How to get there: Located in La Savane. Feeding Fish in Simpson Bay Lagoon is always fun! You can feed the big tarpon from the Simpson Bay bridge, or you head over the north side of the Causeway and feed the fish by the sunken sailboat. How to get there: The bridge is the best place, but you can go almost anywhere! Aquamania Playstation is basically a floating playground! It’s a jungle gym on a boat. All the monkey bars, swings, and slides with none of the bruised and scraped knees. How to get there: In Simpson Bay, park at the beach lot east of the bridge. Walk south on the beach to Aquamania on Kim Sha Beach. Port Marigot Fish Market and Farmer’s Market is lots of fun for the whole family. The fish market is a good way to view sea creatures without getting wet. Take your kids around 8 or 9 in the morning to get the best peek at all the fish and lobsters. The open-air farmer’s market is open almost daily to greet visitors fresh off the boat. Find lovely local art, cheap souvenirs, and fresh produce. Oh, and don’t forget to get a fresh coconut with a straw from the coconut man! How to get there: Located on the waterfront road in Marigot. Fort Louis and Fort Amsterdam are two of Saint Martin’s oldest structures. Fort Louis is an easy hike up a few flight of stairs and offers a stunning view of the surrounding area. Fort Amsterdam is a short walk up a slope. In addition to having a beautiful ocean view, this fort is also the site of a pelican nesting ground. Be sure to keep an eye on your little ones– both forts have a steep drop. How to get there: Fort Louis is located in Marigot. You can’t miss it. Park in town and walk up, or take the back road to park near the top of the hill. For Amsterdam is just southwest of Philipsburg. Approach Divi Little Bay Resort from Philipsburg (or use the Sonesta to make a u-turn if coming from Cole Bay) and make a left into Divi’s road. Park before the gate and let the guards know where you’re going. Walk to the far end of the resort until you hit the fort. Beaches are, of course, the most popular family activity on Saint Martin. The best beaches for kids are Friar’s Bay, Pinel Island, Simpson Bay Beach, Indigo Bay, and Galion Beach, Kim Sha Beach, Divi Little Bay Beach. Koningsdag is celebrated on April 27, the birthday of King Willem-Alexander, the monarch of the Netherlands. Since Sint Maarten is part of the Kingdom of the Netherlands, it is also celebrated here. It’s not quite as a big a deal here as it is in Europe’s territories. Sint Maarten’s Carnival falls during Koningsdag, so it is someone overshadowed by that event. Still, I did see a few photos of friends’ children wearing orange for an early celebration of King’s Day at school. I asked a few of the local kids what they do during Koningsdag. Big King, one of the teens who volunteers with our little league team, told me that they eat Dutch bread and cheese. I should have bought some. Instead, we ate chocolate on bread for breakfast, which is pretty Dutch thing to do! It’s funny to think that because we live here, we have a king and queen. It’s certainly different than the U.S., but you have to admit that it’s pretty cool to be able to take a day off to celebrate your king’s birthday! Stuff Dutch People Like has a bit more on Konigsdag, if you’re interested. You’re not really from Saint Martin until you eat salt fish! At least, that’s what I read in an SXM cookbook last week. So today, I tried saltfish for the first time. You can be a “real” islander, too, when you try this recipe by blogger CS! My co-worker, who was born and raised in Trinidad, has been going on a Trini-kick for the past few weeks. He booked his tickets to Carnival, and has been getting in the mood for it by speaking the language, and eating the food. Last week, he brought up that he was missing fry bake and saltfish. In his own words, “only us dumb Trinis would call it fry bake. What is it, fried, or baked? It’s not both, so why call it fry bake? !” The man has a point! I never got to experience true fry bake and saltfish when I was in Trinidad — what I did have though was Bake and Shark in Maracas, which is something everyone needs to go eat if you are a foodie. Shark isn’t exactly an easy ingredient to find locally, however, saltfish is. American University of the Caribbean knows how to say goodbye in style. Dr. Testa, the senior associate dean, is moving on to a new place and a new position. So, the school threw him a tropical party for the staff and students to enjoy! The funniest part of the celebration was the Dean Testa bobble-heads that faculty members auctioned off. The best part was the yummy food. There were so many things to taste! Fruit juice, ice cream from Carousel, fresh fruit, coconuts… yes please! One of the tables was made to look like a traditional Caribbean dress, complete with someone wearing it. We managed to get one of the last coconuts from the coconut man. To top it off, a local youth drumming group came and played a few songs. It doesn’t get better than tropical fruit and steel drums! Happy trails, Dr. Testa. My top fears? Finding a dead person in a public restroom, centipedes, and stepping on a sea urchin. Some say it was Eleanor Roosevelt who said, “Do one thing every day that scares you.” Whether or not she coined the saying, I believe that it’s a good one to live by. I don’t think it means that we should always do dangerous or ridiculous things. I think that it means we should slowly widen our comfort zone, one baby step at a time. When we first moved to the Caribbean, I was terrified of sharks. Irrationally so, especially since there has been no shark attack in Sint Maarten for about thirty years. I was shaking during our first snorkel expeditions. Soon, I was able to go further and deeper and enjoy it more. Now, I can happily surf offshore for hours with barely a thought in the back of my mind. Sea urchins still plague me, though. Ben got some spines in his feet during a tropical storm, when the urchins were washed onto the beach. My friend Jay got a massive urchin sting from barely brushing up against one while floating in a tide pool. The last thing I want is to be stabbed AND stung at the same time! On Ben’s first day of break from medial school, we decided to explore a few little-known cays off the coast of Le Galion beach. This place is hard to find, but it’s amazing. In the winter, you can watch wales migrate from viewing towers. Year round, you can walk or snorkel to small cays in the shallow water. Walking through the water to the first couple cays was easy. But the path to the last cay was slightly terrifying. We began to the slow trek through the rocky water, avoiding the little spiky balls of evil that dotted the sandy ocean floor. The water was only about ankle-deep, but the waves breaking on the nearby rock barrier sometimes spilled violently over into the shallow zone, roughening the water and obscuring our view of the rocks, shells, and urchins below. Slowly, we picked our way through the obstacle course. I prayed that I wouldn’t feel a needle-sharp spike shoot through the soft soles of my flip-flops. Why didn’t I wear water shoes? About halfway across, I couldn’t find a good place to set my foot. I searched carefully beneath the ripples, trying to find a clear spot. All I could see, for yards around, was the minefield of sea urchins. I could hardly breathe for a moment. My whole body froze. So this is what it means to be frozen with fear, I thought, How silly. I guess I can get out of this the same way I got into it. Still, I had an awful vision of slipping on a mossy rock and landing prone on the urchin-covered rocks. Ben stopped picking his way through the water and looked back at me to make sure I was OK. I looked at him, then back at the water. The red centers of the small black urchins glared at me from between the rocks, like wicked red eyes. “I don’t think I can do this,” I said, “There’s literally nowhere to walk.” Ben waded slowly back to me, watching his steps carefully. “Get on my back,” he said, “I’ll carry you.” He turned, and I jumped, clinging to his neck for dear life. He cautiously moved through the rocks, the thick rubber soles of his shoes protecting him from the smaller spikes. Before long, we reached the island, and Ben deposited me on the dry rocks. We had made it! And it was so worth it. The small island offered a gorgeous view of Saint Martin. Waves beat against the rock on one side, and a brilliant blue tide pool calmly beckoned on the other. A magical, lonely, unspoiled place. Often, the places most worth going have a scary path. You have to face your fears and step out into an uncertain place to get to the solid mountaintops and peaceful tide pools of life. But you don’t have to do it alone. We need each other to face our fears and support one another. Don’t live in your comfort zone! Get out and do something that scares you, and don’t be ashamed to take a friend along.